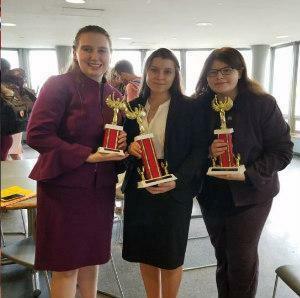 On March 16, senior Devyn Sword and juniors Stella O’Brien and Joan Cottingham qualified for nationals in Forensics in Milwaukee following their outstanding work at the Grand Tournament at Stuyvesant High School. The top six competitors in their respective categories at this tournament moved to nationals. Stella placed first and Devyn placed second in the Student Congress category, and Devyn came in sixth in the Drama division. The tournament will be held in May—best of luck girls, and keep up the great work!